Hopefully, your day has been a good one so far. Because now, this good time comes to an end. This article on language-easy.org is about an important topic in German Grammar, the German adjective endings. Well, there are moments in life in which I am really glad about being German! So, I became familiar with this rather complicated topic from the beginning on. Unfortunately, you will have to enter this sad world of German adjective endings. But don’t worry, in this article we will try to find some useful rules which can guide you. Furthermore, we will illustrate the correct way to use German adjective endings in many tables and examples. So, you will see at the of this text, that German adjective endings can be hard – but with a lot of studying and reminding the tables and rules, they are no big deal. Well, while I’m just going to happy about suffering students, you can see in the following chapter the basic tables about German adjective endings. Viel Glück, everyone! So, let’s start right ahead with the most important part of this article about German adjective endings. First of all, we will have a look at some tables which will show us the endings of adjectives which describe a noun with an definite article. After that, we will have a look and adjective endings for nouns with an indefinite article and without any article at all. In this table we will use the adjective “frei” (free) as a example for a regular German adjective. So, you will be able to apply this table to most of German adejectives. Well, as already mentioned, you can use these German adjective endings only for adjective which describe a noun that has a definite articles. So, definite articles in German are “der, die, das”. In the following, we will illustrate the way to use these adjective endings correctly. “Das schnelle Auto gefällt mir.” – I like the fast car. “Ich sehe immer nur die hübschen Frauen.” – I just always see the pretty women. “Dem jungen Mann wird übel.” – The young man gets sick. So, as you can observe in these examples, you have always have to be careful! Always try to keep in mind the number, case and gender of your noun. Now, we will have a look at the German adjective endings for adjective that describe nouns with indefinite articles. Of course, there are differences to the table before, so study that table carefully. As in the previous table, the German adjective endings are of orange color. So, in this table we have used the German adjective “schön” (pretty). Of course, all of you remember German indefinite articles. But just in case you don’t, there are “ein, eine”. Finally, let’s use some example to get sure that you use these German adjective endings in the right way. “Was für ein wunderschöner Tag!” – What a wonderful day! “Ich habe mein Brot einem armen Mann gegeben.” – I gave my bread to a poor man. “Ich kann dem Geschmack eines kalten Bieres nicht wiederstehen” – I can’t resist the taste of a cold beer. Well, in case the last example phrase made you desiring a cold beer – hold on! Unfortunately, there are still some forms left before we can close this chapter of German grammar. But I will make it quick, don’t worry. 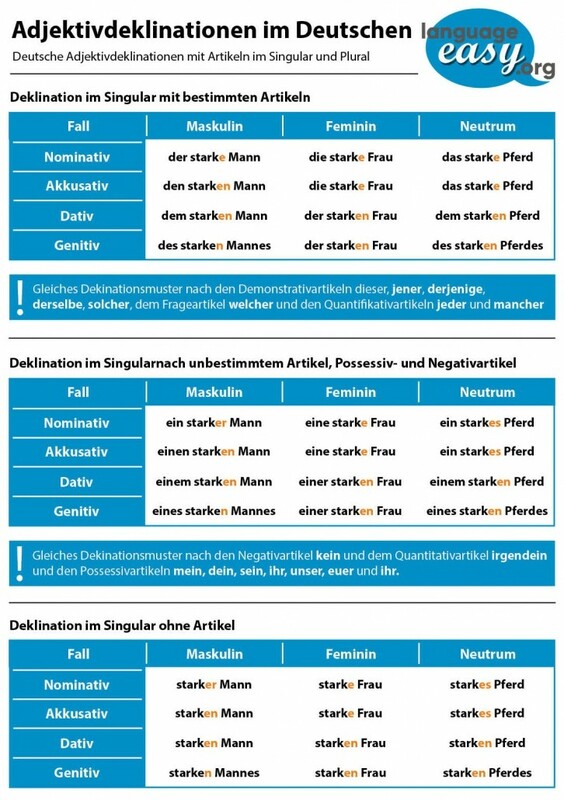 In the following, you will see the table which shows German adjective endings for adjectives that describe nouns with articles. There’s not too much to say anymore, I think you should have understood the basic principles so far. Anyway, here is the table. Well, these kind of German adjective endings are not really common. So, they are mainly used in texts, especially in small advertisement in newspapers. Furthermore, these kind of adjectives may occur in sayings. Here are some examples for this rather rare case. “Starke Männer für Baustelle gesucht!” – Looking for strong man for construction side! “Neue Frauen braucht das Land!” – The country need new women! Unfortunately, we have come to the end of this wonderful topic. Actually, German adjective endings are not that difficult. Just mind the gender, number and case and you are on a good path. Furthermore, try to remember the tables we have seen in this text. Well, you will see that they can be quite helpful. Anyway, there are two useful hints I can give you. First, the case-endings are – in principle – identical with the definite article, but without “d”. So, only in neutral nominative singular, “das has to be replaced by “e” and in neutral accusative singular the same. Second, the German adjective endings of noun-adjective constructions only have no declension. Well, in the example “Mein Computer war sehr teuer.” (My computer was very expensive.) you can see, that the possessive pronouns “mein” adapts its ending and not the adjective. In case there you still have some questions about German adjective endings, check out the article on Wikipedia.